During the reign of Djoser (3rd dynasty) a terrible drought lasted for seven years. Translation by Lichtheim Imhotep, a high official and Renaissance man, revealed to the king that the Nile had its origins in a land consecrated to Khnum and gave an account of the building materials available at Elephantine. Khnum appeared to Djoser in a dream with the promise to end the drought and described how a temple should be built. Grateful, Djoser re-established the cult of Khnum at Elephantine. 10 Khnum is there as god ..... his soles, his side is placed near him. The door-bolt is in his hand, the wings of the door open according to his wishes. He is there as Shou, who lives on the banks of his surroundings, this is how he is called. He reckons the land of Upper and Lower Egypt, to give him the portion of each god. He brings ... and .... and geese and fish and all things of which they live. A rope is there with a writing tablet and a mast (?) with his reed door. He is therefore the god who lives on the banks, because Shou is set above (?). 12 sought for building the temples of the gods of the North and South, the stalls for sacred animals, the pyramid for the king, all statues that stand in temples and in sanctuaries. Moreover, incense is set before the face of Khnum and around him. 14 of the river in view of the town of Elephantine. There is a stone in its middle, in whose interior evil (?) is contained... 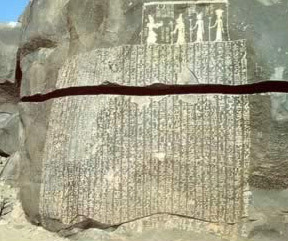 It is called the rock of Elephantine. List of the names of the gods in the temple of Khnum: Sothis, Anukis, Hapi, Shou, Geb, Nut, Osiris, Horus, Isis, Nephthys. 15 Learn the names of the stony materials which are to be found lying in the midst of the rocky mountain, which are in the east and in the west, which are on the island of the river, i.e. Elephantine, which are in the desert, which are inland of the east and west banks, which are in the midst of the river: bekhen, nemi (dead - weathered - granite), metbekhteb, raqes, uteshi-hedsh (onion stone ?) in the east, perdjen on the west bank, teshy inland from the west bank and they are also found in the river. 17 Hebegti, temi, these are the kinds of stone from the interior of the land. Mehi, maki, ibehti, ore, gesankh, green make up, black make up (antimony ? ), herdes, sehi, mem, saphen, in that part of town. I heard this and my heart was sad, after I had heard the message (?). I spread my clothes. A purification was done, a secret procession and an offering was presented..... of bread, beer, geese, cattle, and all the good things for the goddesses at Elephantine, whose name was mentioned. 21 everything will be brought forth by the million (?) and everybody ...... in whose granary there had been dearth. The land of Egypt is beginning to stir again, the shores are shining wonderfully, and wealth and well-being (?) dwell with them, as it had been before. Djoser's decree Then I awoke happy (? ), my heart was decided and at ease. I decreed this order to the temple of my father Khnum. 23 Royal sacrifice for Khnum-Re, lord of the cataract, first of Nubia, as reward for what you favour me with. I make you a gift of your western shore by the mountain of the dusk and your eastern shore by the mountain of dawn, from Elephantine to ...... with twelve aruras on the eastern and western shores, with the plants, with the harbours (?) with the river and with every settlement on these aruras.